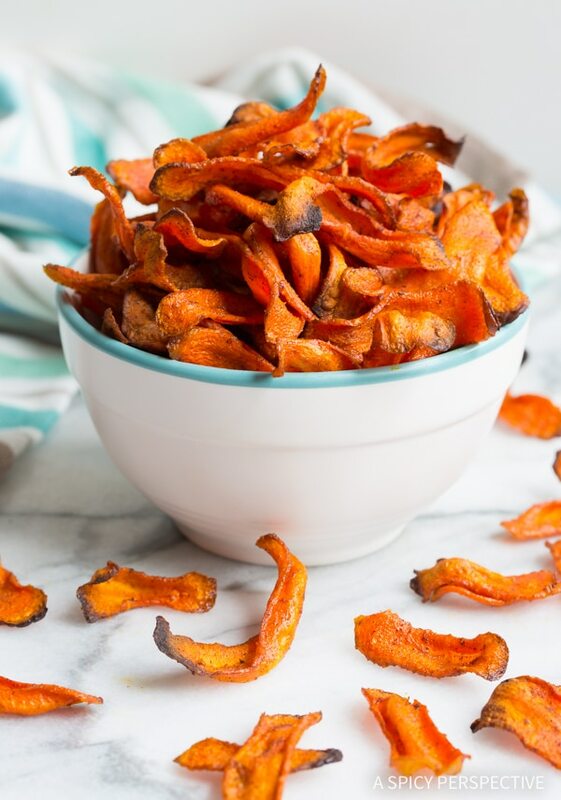 Healthy Baked Carrot Chips – Get your crunchy chip fix without ruining your diet! 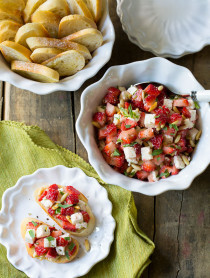 These gluten-free, low-fat snacks are easy to make and easy to love! I find when I’m trying to stick to a clean diet, it’s the crunchy stuff that tempts me the most. Pretzels, potato chips, tortilla chips… I can’t seem to keep my hands out of the bowl. Over the years I’ve made all sorts of baked vegetable chip recipes to help me steer away from heavier carbs. I’ve noticed, that not all vegetables react the same when sliced thin and baked. Some require high heat. Some taste best when baked low and slow. Some even need a little marination time for good results. 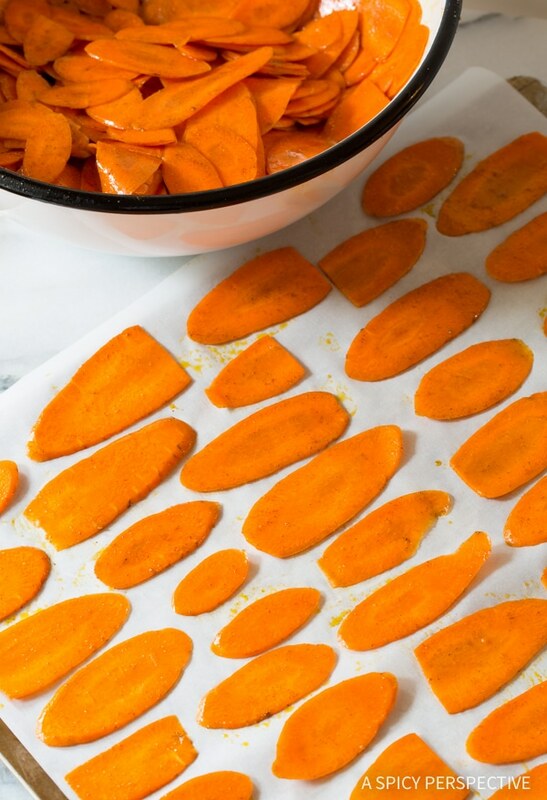 Healthy Baked Carrot Chips are one of the most tantalizing vegetable chips because they are naturally sweet and turn very crisp in the oven. You can bake them on low or high heat, and achieve the same crisp texture and flavor. However, they seem to be more attractive, with a brighter color, when baked on high heat for a short amount of time. Carrots are a wonderful platform for sweet and savory spices. In this recipe I seasoned the carrots with both cinnamon and cumin for extra wow factor. 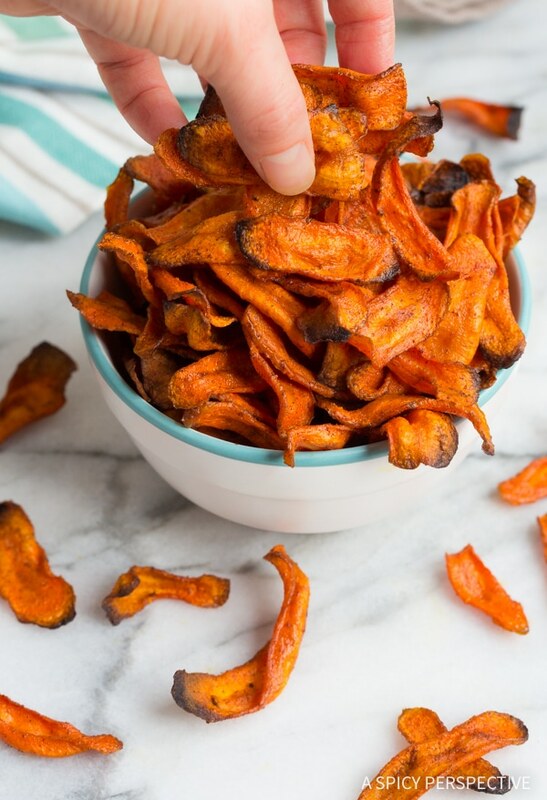 Healthy Baked Carrot Chips taste amazing with just salt, but the spices make them especially delicious! Pick the biggest fattest carrots you can find. Slice them paper-thin on an angle to create elongated chips. I use a mandolin slicer to do this, but you could use a chefs knife or a slicing blade on a food processor. Toss the slices with oil, sea salt, cumin, and cinnamon. 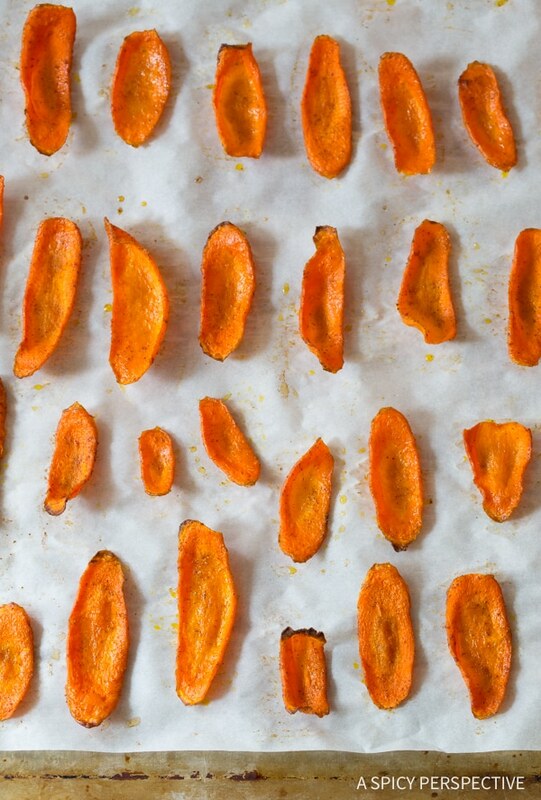 Lay them out on baking sheets in a single layer. 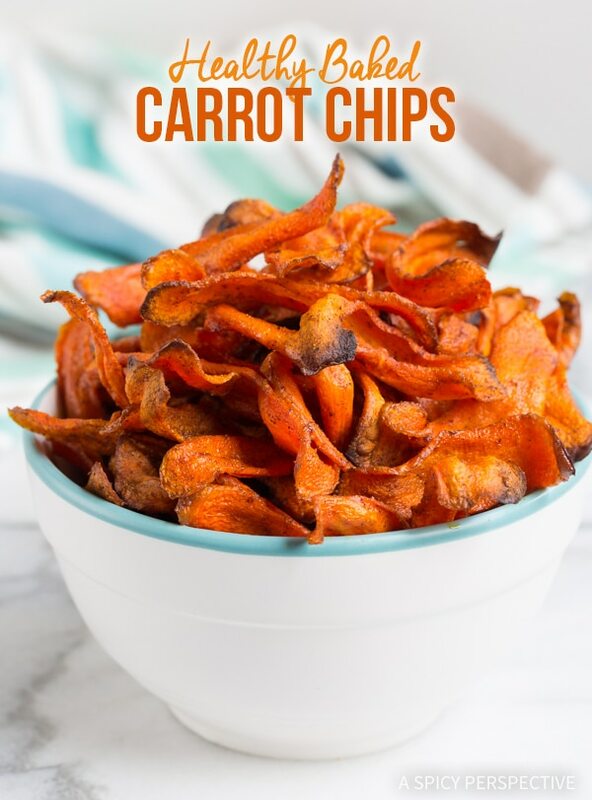 Healthy Baked Carrot Chips are great alternative for lunch boxes, late night snacking, and keeping in your desk drawer for the 2 o’clock carb cravings. This month when the fatty potato chips start calling your name, fight back with chips that offer vitamins instead of guilt! 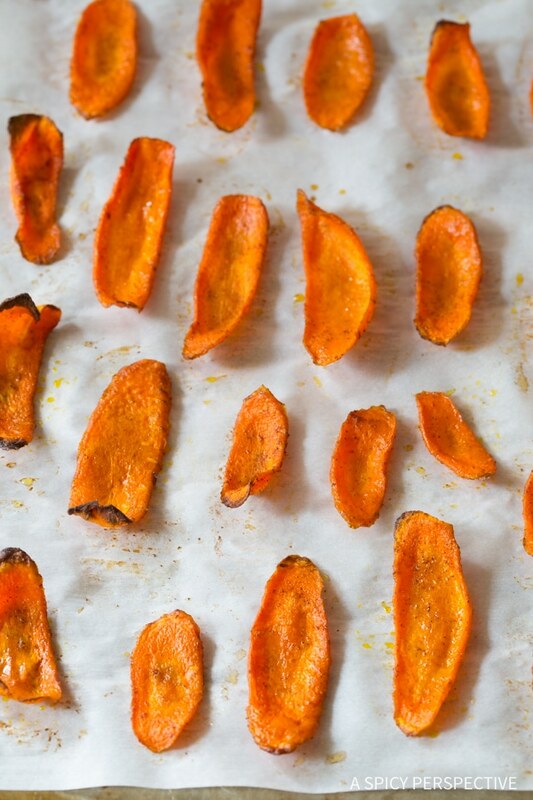 See the Recipe & Video for How to Make Healthy Baked Carrot Chips Below. 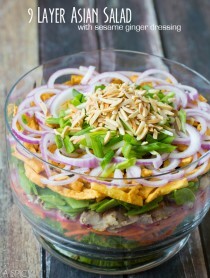 Healthy Baked Carrot Chips Recipe - Get your crunchy chip-fix without ruining your diet! 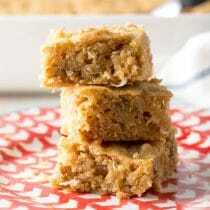 These gluten-free, low-fat snacks are easy to make and easy to love. Preheat the oven to 425 degrees F. Line several large baking sheets with parchment paper and set aside. Trim the carrot tops off. Starting on the thick end slice the carrots paper-thin on the bias to create elongated slices. 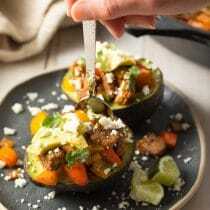 You can do this with a chef's knife, but it's better to use a mandolin slicer on the smallest setting. When you get down to the thin end, stop and save them to use in soup or salad. 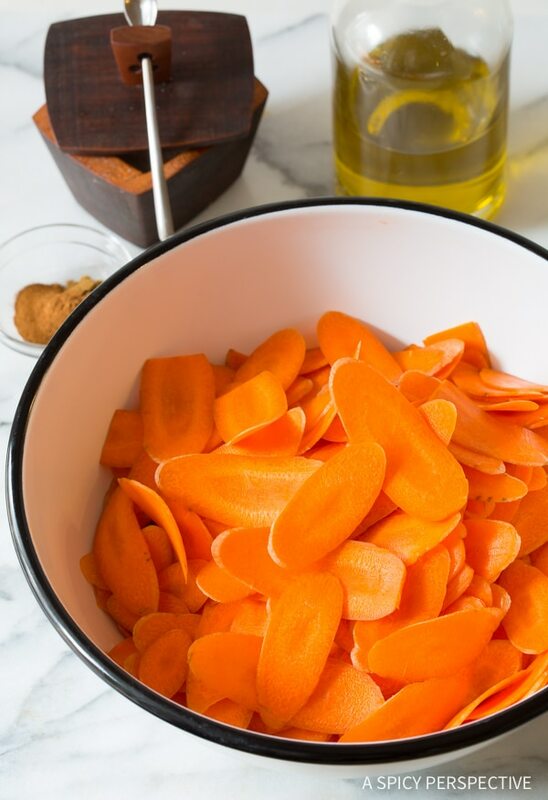 Place the carrot slices in a large bowl and add the oil, salt, cumin, and cinnamon. Toss well to thoroughly coat. Then lay the slices in a single layer on the baking sheets. Bake for 12-15 minutes, until the edges start to curl up and turn crisp. Then flip all the chips over and bake another 5-8 minutes to crisp the bottoms. Once cool, store in an airtight container for up to 2 weeks. To avoid flipping the chips, you can bake the chips at 325 degrees F for approximately 30 minutes. However, they are prettier when baked at high heat. If your oven is older, the chips in the very center of each pan might need a couple minute longer than the chips around the edges. This is such a great idea! My kids enjoyed them!! I have been making loads of apple chips and wanted to try another homemade chip. 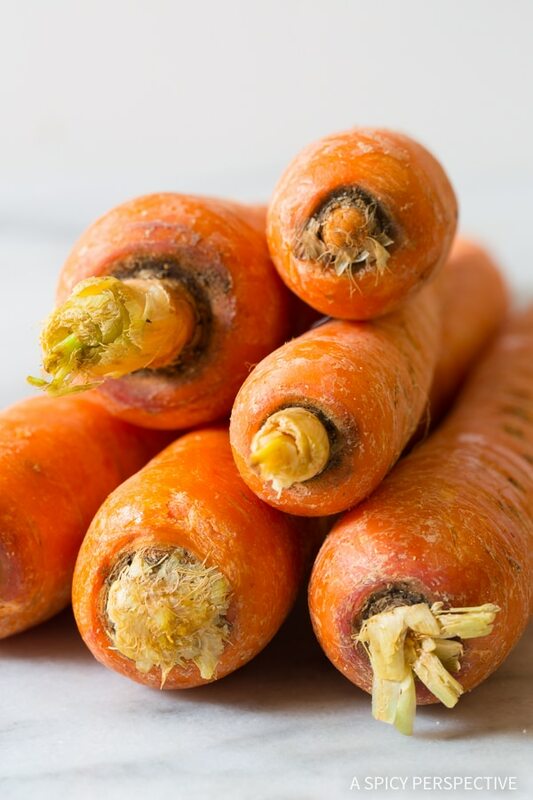 These carrots worked perfectly and I love this flavor profile! I made these for the kids and I last week! We loved them! So funny to see these here. I made oven roasted sliced carrots the other day and some of them got a little over cooked and I thought so this is what carrot chips would taste like. And I loved them. Here they are done right! I will try this recipe out. Thanks! Hmmm… It sounds like your oven has hot and cool spots. Do you have a convection option? That would probably fix the issue. Refer to EGINNY Comment/advice on/about Dec 15th 2017. Haven’t tried that but if I have the same problem I will. I didn’t have cumin so substituted with garam masala, cinnamon, and sea salt. So amazing – thank you so much for the idea! Very yummy! Doesn’t taste like a carrot anymore! We liked them the best, when they we’re hot! Great idea!! Will def be trying this. Think we could use it instead of tortilla chips like in nachos? Lol the superbowl is coming up. I forgot to rate! 5 stars! I’m really bad at commenting when I make things, but I have to share! I made these mainly for myself since I live in a household with two people who never eat healthy because nothing they eat goes to their hips (not fair) and two grandparents who are super, super picky. Everyone loves them!! My tip: if they’re not drying to a crisp, throw them in the microwave in a big ‘ol pile (after you’ve thrown them in the oven) and set it to defrost. Every couple of minutes fluff up your pile to turn the pieces over, and they get super crispy! These took me a pretty long time (I’m not a terribly fast chef) but they’re sooo good I have to figure out how to make them faster! I made these today because I wanted some healthy snacks for work. I love trying new recipes (my degree is in nutrition), especially those that are healthy, and I was glad I made these. They were delicious. I don’t eat as much carrots as I should, but I will now. This recipe is a keeper. 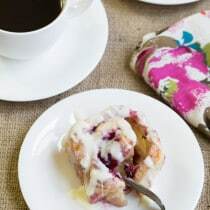 I’ve already shared this recipe with friends, family, and on my Twitter page. I will be on the lookout for more healthy veggie chips. I didn’t know what I had been missing before I tried making veggie chips. Thanks! Hello! I was wondering how long the healthy baked carrot chips stay good for and the proper way to store them? Love the sound of carrot chips! I so have to try these! Couldn’t get them crispy, no matter temperature adjustments or time.. They’re either soggy or burnt. Bummer, we were looking forward to these! I agree. I’m really confused how everyone is making these work. The small chips are totally burnt and the larger chips are flimsy and not very pleasant to eat. i love the idea but I don’t know what I’m doing wrong. How long will these keep in an airtight tin? Thanks. 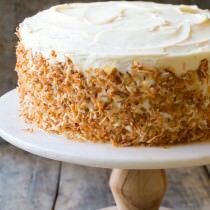 How do you store these once baked ? Will they become soft in a zip.ock? I usually keep them in a zip bag in the pantry. As long as they are all crisp, they will keep for a couple weeks. 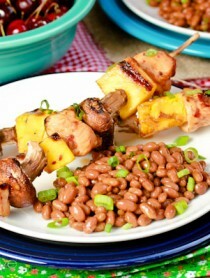 However ours never last that long – The kids gobble them down! Pingback: » Eat Your Veggies! I love carrot chips and can’t wait to use this to make them myself. Might be dangerous. I might turn my own skin orange from eating too many. 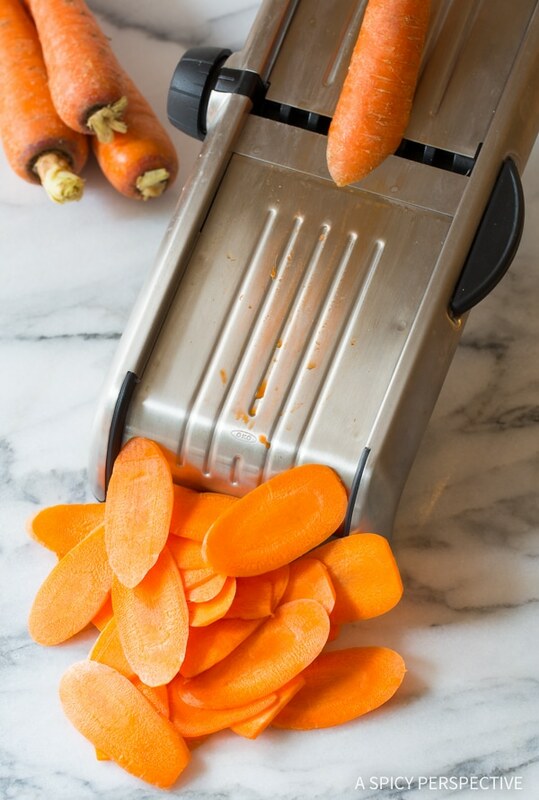 I roast carrots all the time, but never thought of slicing them like chips. Will fix this recipe this week for sure. I wish I had some of these in front of me now!